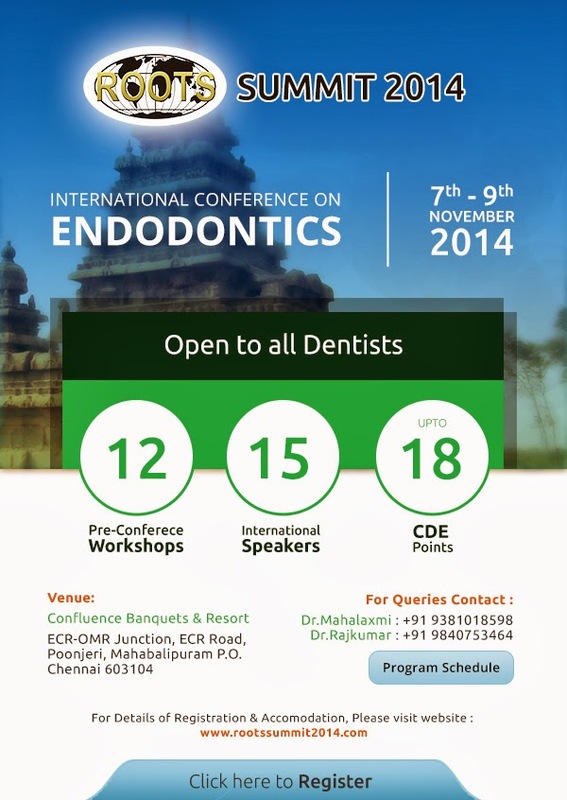 'Roots Summit 2014' is an internationally acclaimed endodontic conference, attended by dentists from all around the world. 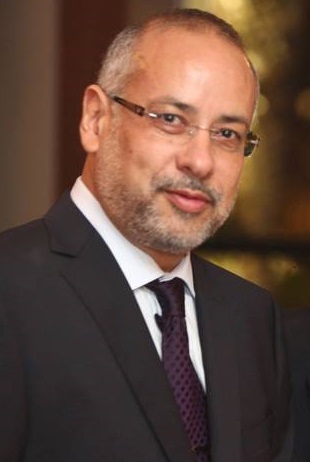 'Roots', an online endodontic forum that's shared and spread the knowledge and clinical expertise of many stalwarts in the field of Endodontics over more than a decade, conducts Summits once every two years. We cordially invite all dentists; endodontists, general dentists, specialist dentist( any branch), graduate and post graduate students to participate in this mega event. 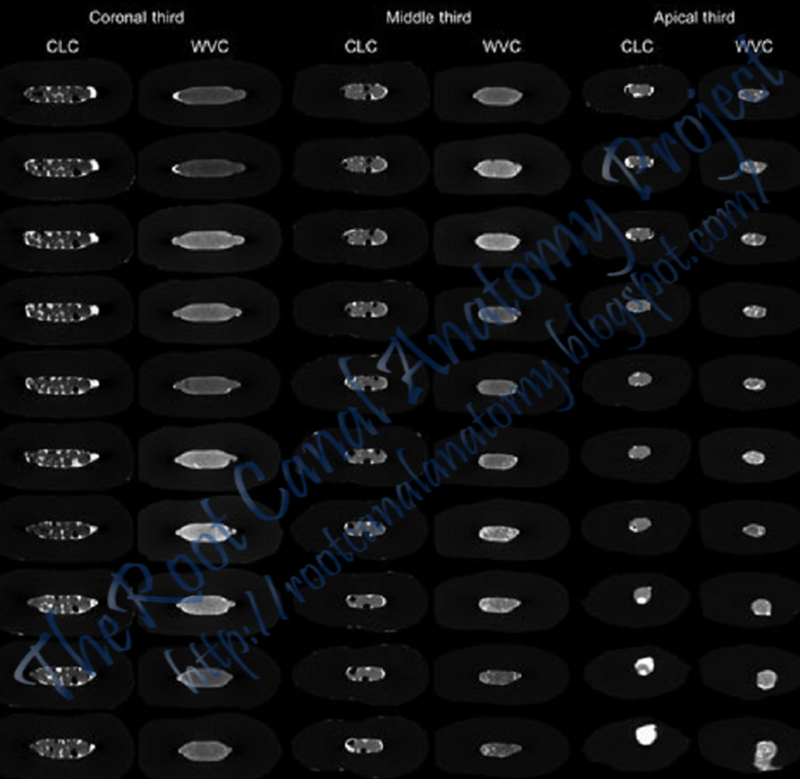 Aim: To assess the percentage volume of filling materials and voids in oval-shaped canals filled with either cold lateral condensation or warm compaction techniques, using micro-computed tomography (micro-CT). 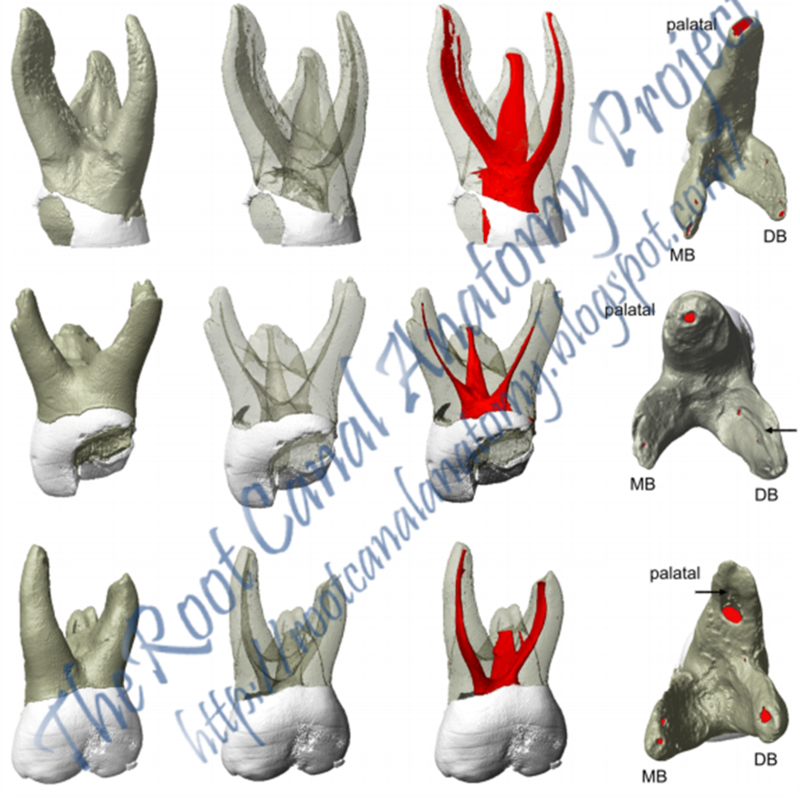 Methodology: Twenty-four single-rooted maxillary premolar teeth with oval-shaped canals were selected, the root canals prepared, and assigned to 2 groups (n=12), according to the filling technique: cold lateral compaction (CLC) or warm vertical compaction (WVC). 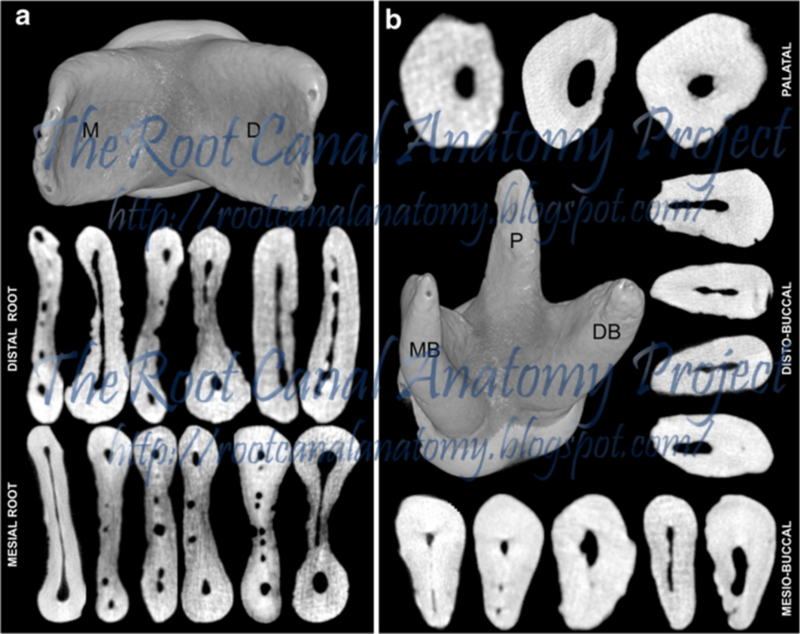 Each specimen was scanned using a micro-CT device at an isotropic resolution of 12.5 μm. Percentage volume of root filling materials and voids were calculated, and data were statistically analyzed using Student t-test and Friedman's test, with a significance level of 5%. Results: Overall, mean percentage volume of gutta-percha, sealer and voids were 82.33 ± 3.14, 13.42 ± 2.91, and 4.26 ± 0.74, respectively, in the CLC group, and 91.73 ± 4.48, 7.70 ± 4.44, and 0.57 ± 0.44, respectively, in WVC group, with statistical significant difference between groups (p < 0.05). At the apical level, differences in the percentage volume of filling materials and voids between groups were not significant (p > 0.05). No root fillings were void-free. Conclusions: Warm vertical compaction produced a significantly greater volume of gutta-percha and a significantly lower percentage of voids than those achieved with cold lateral compaction. 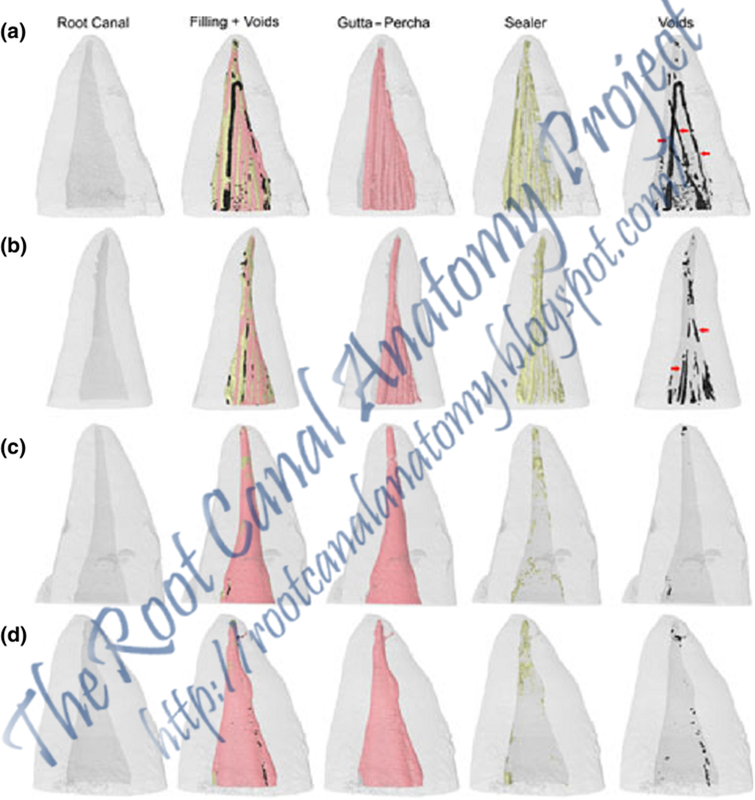 Distribution of sealer and voids within the root canal space after root filling procedure was unpredictable, irrespective of the root filling method. 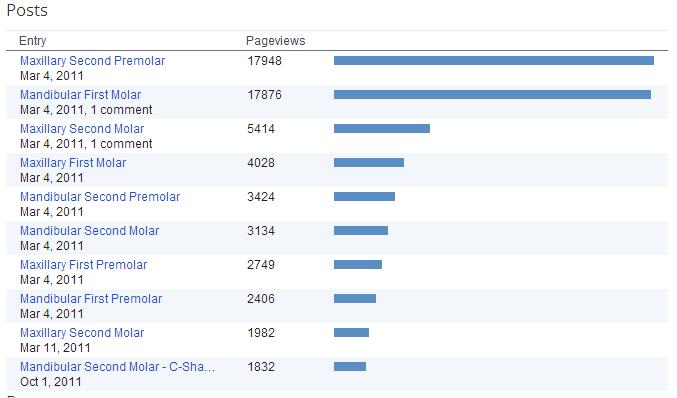 Begun formally in 2011, The Root Canal Anatomy Project completed 3 years online on 5th of March. 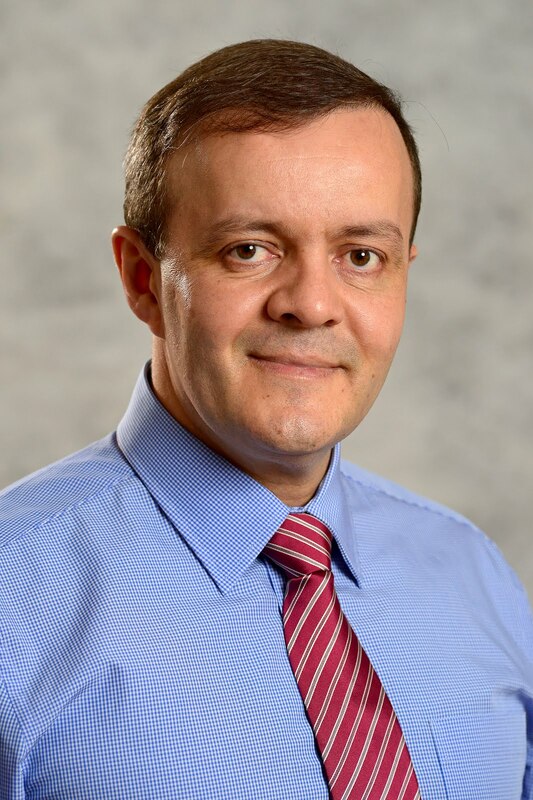 This blog was developed in the Laboratory of Endodontics of Ribeirao Preto Dental School - University of Sao Paulo - with noncommercial and educational purposes. 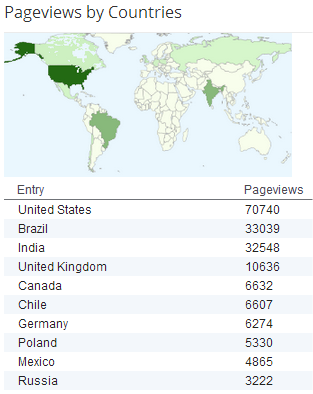 During this period, the blog was visited by people from 172 different countries with more than 370,000 page views. 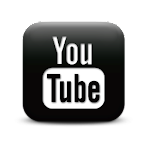 The videos were watched more that 100,000 times and the material was downloaded more than 10,000 times. 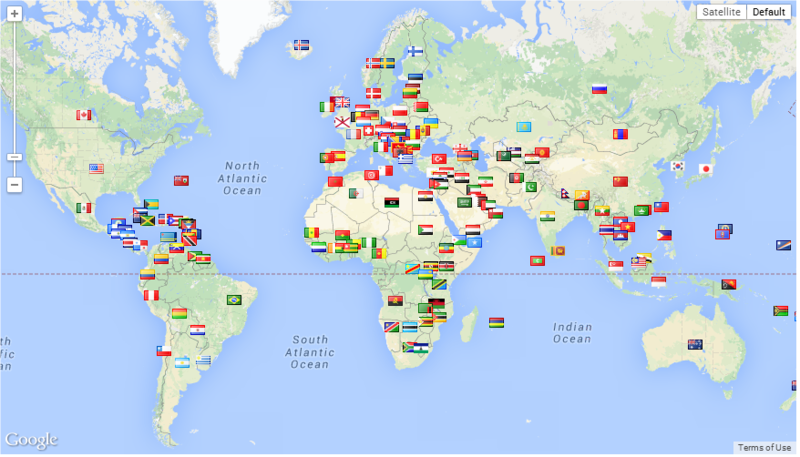 Considering that root canal anatomy is a very specific subject in the endodontic field, we believe that the blog is achieving its goals. Thank you for your support and stay tuned for updates. This was to investigate the root canal morphology of primary molar teeth using micro-computed tomography. Primary maxillary (n=20) and mandibular (n=20) molars were scanned and analysed regarding the number, location, volume, area, structured model index (SMI), area, roundness, diameters, and length of canals, as well as the thickness of dentine in the apical third. Data were statistically compared by using paired-samplet test, independent sample t test, and one-way analysis of variance with significance level set as 5 %. 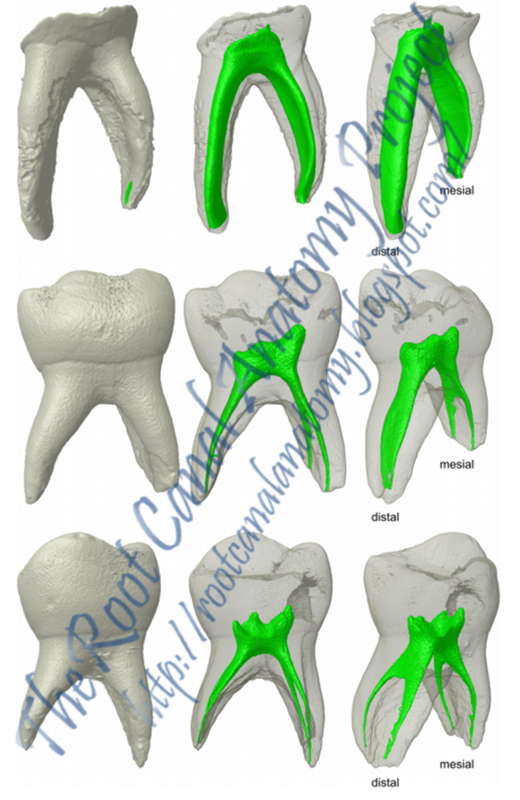 thorough understanding of the morphological variations of root canals in primary molars to overcome problems rela-ted to shaping and cleaning procedures, allowing appro-priate management strategies for root canal treatment. External and internal anatomy of the pri-mary first molars closely resemble the primary second molars. The reported data may help clinicians to obtain a thorough understanding of the morphological variations of root canals in primary molars to overcome problems related to shaping and cleaning procedures, allowing appropriate management strategies for root canal treatment.